I shouldn’t have read it before going to see Ballet Black on Tuesday. I dipped into a memoir of Isadora Duncan by Edward Gordon Craig. ‘She threw away ballet skirts and ballet thoughts. She discarded shoes and stockings too… She was speaking in her own language, not echoing any ballet master, and so she came to move as no one had ever seen anyone move before.’ As I walked to the Linbury Studio Theatre, this is what I had in mind: a new language of dance, free of conventions. In Dopamine (you make my levels go silly), Ludovic Ondiviela happily chooses a subject (attraction, love, lust) that dance can do really well (and we can easily understand), wrapping it in Fabio D’andrea’s music that is dripping with so much sentimentality that by the time the dancing starts we are like sponges at high tide. On top of that you can sense immediately that the abundantly sensual Sayaka Ichikawa is happy and impulsive and drawn to her man, and that Jazmon Voss is equally drawn to her. We thrive on their emotional involvement and Ondiviela is good at making his dancers talk without words while keeping the conversation colloquial. The One Played Twice is once too much for me. Javier de Frutos is in love with the genre but the acapella male-voice Hawaiian Barbershop quartet just doesn’t do it for me. Nevertheless the two couples set off along the beach together, but the weather gets really humid and enervating, a balmy day without a wave, and there’s nothing to do and they seem to be going round in circles like a hoola-hoop, until Kanika Carr’s solo resembles Sarah Kundi’s and they’re back where they started. I have seen the imaginative heights to which de Frutos can rise but The One Played Twice is as low-flying as the bass in the barbershop quartet. Glen Miller and Dmitri Shostakovich are strange bedfellows, though they never really get into the same bed in Christopher Marney’s War Letters. One goes out dancing while the other comes back from a dangerous sortie, and so it goes on. When the Glen Miller plays, the choreographic language finds its inspiration in social dancing, but when the Shostakovich plays the choreography falls back to the default classical pastiche. There is one moment that defies the trend: Ishikawa crawling away under the coat. But the facile patterns and thin characterisations wrapped in a pseudo romanticism about war all reek of Matthew Bourne’s influence: you know what’s coming and in no time it’s delivered. 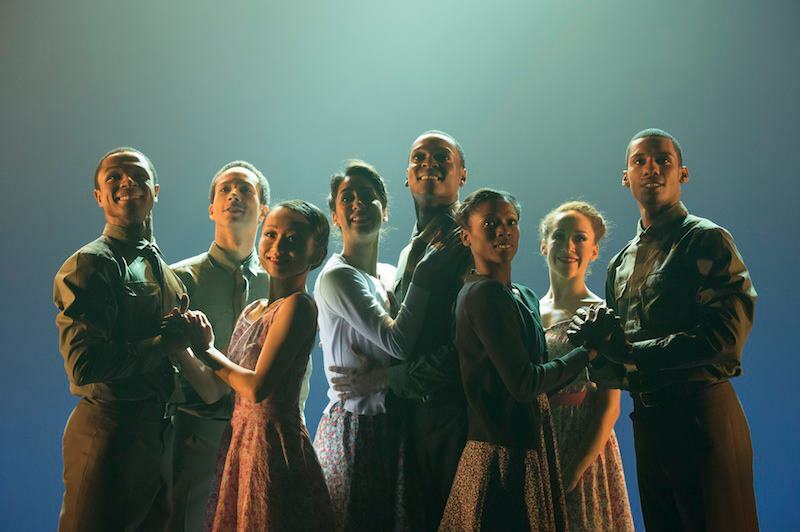 What we do see throughout the evening, and what the audience rewards with such evident relish and pride, is a company of eight dancers who are a pleasure to watch, and who can dance as if there’s no tomorrow. All that is missing on this program is a language they can embrace with all the passion at their disposal. I was waiting for that Isadora moment when someone would come on stage and dance their words. Maybe I’m just going deaf.